Above: Empty Route 40 between Franklin and Mulberry streets — aka “The Highway to Nowhere” — as it looked this past Friday, when the rest of Baltimore was returning to normal. The most indelible image from last week’s blizzard was that of clogged bumper-to-bumper traffic on virtually every expressway, creating horror stories of delay and entrapment throughout the region. 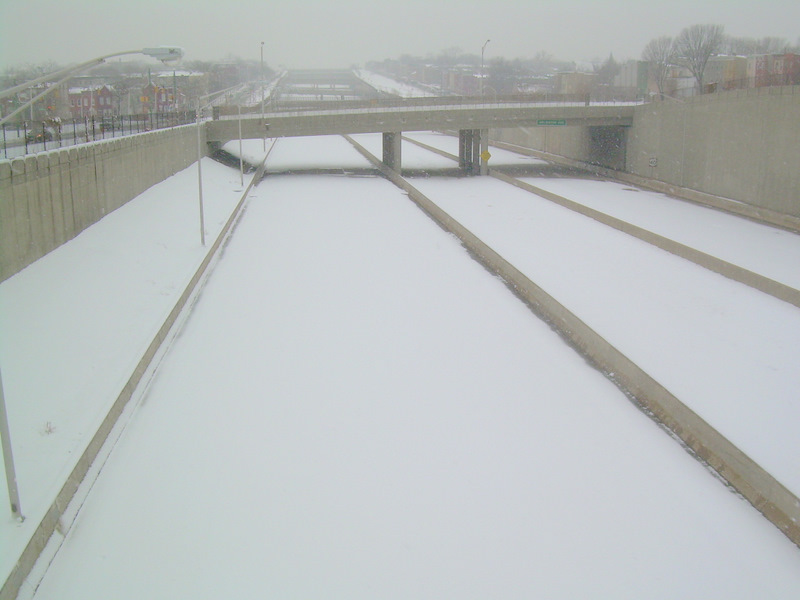 But West Baltimore’s Franklin-Mulberry Expressway or FMX (my name for the one-mile, six-lane highway sandwiched between Franklin and Mulberry Streets, just west of Martin Luther King Boulevard) remains just the opposite – a vast, barren expanse of virgin snow without even a single set of tire tracks to mark the territory. The so-called “Highway to Nowhere” has been totally closed westbound since last November, with the eastbound lanes recently closed as well, in order to build a relatively small expansion of the MARC parking lot at the west end at Pulaski Street. But the FMX closure has caused nothing remotely like that. The way the entire expressway was shut down indefinitely without debate or even publicity, just to make it easier for construction crews, speaks volumes. Motorists have been able to make the needed minor adjustments with ease. For the past three months, traffic has merely had to stay on the adjacent Franklin and Mulberry streets, as necessary. There have been a few temporary delays, but the expressway itself has proven to be totally dispensable. The region’s other expressways (such as I-83, I-95 and the Beltway) have been the scenes of blizzard horror stories for a day or two this winter, but the FMX horror stories have lasted for four decades. It is common knowledge that the highway totally destroyed several neighborhoods and displaced thousands. Superfluous as the recent closures have shown the huge, unfinished expressway to be, the long-range plan is to preserve the FMX indefinitely for the transit Red Line. The Red Line would maintain the expressway as-is, except for the minor modifications now under construction for two blocks at the west end to accommodate the new MARC parking lot. Using the expressway to encase the transit line will making it slightly cheaper to build, while isolating it from what remains of the neighborhood. The expressway makes as little sense from a traffic engineering point of view as it does from a human and design standpoint. Its original purpose was to be the east end of Interstate 70, a highway that extends all the way to Utah. But since it never got connected, it became three expressway lanes in each direction dumping into three surface lanes of Franklin and Mulberry Street. And since a standard expressway lane has a flow capacity of approximately double that of a surface urban street, there is a gross capacity mismatch. Here’s the math: Three expressway lanes are approximately equivalent to six surface street lanes. At Pulaski Street, the three expressway lanes are necked-down to join with two surface lanes from Franklin Street. That’s an equivalent traffic capacity of eight surface lanes ( (3×2) + 2) squeezing down into three surface lanes as it proceeds westward onto U.S. 40. The proposed Red Line would make it even worse. The Red Line plan would reduce the street width to the west down to only two lanes, in order to squeeze in the transit line. So that’s an equivalent reduction from eight lanes down to two. You don’t need to be a traffic engineer to realize that the Red Line will cause extreme traffic congestion to the west of the end of the Franklin-Mulberry corridor, and in fact, the MTA’s Red Line traffic impact reports say just that. The FMX occupies a vast amount of space that could be used for people, instead of a wasteland. While planners tout the expansion of the MARC parking lot at the west end of the expressway as the first step in “transit oriented development,” real life experience is just the opposite. MARC parking capacity has already been increased several times in the past, with no ensuing development. Easier commuter parking thwarts new development rather than encouraging it. Redevelopment needs to begin at the east end, where it can take advantage of the energy of downtown. There is an urgent need to redevelop the gigantic soon-to-be vacated Social Security complex and to build on the redevelopment which has already taken place with the University of Maryland campus and Biotech Park, Heritage Crossing and other projects. All of this can provide far more fuel for economic development than can the expansion of the MARC parking lot. Even just a partial demolition of the expressway in the vicinity of MLK Boulevard could be used to create a critical linkage between downtown, the University of Maryland campus, the currently-landlocked Social Security complex, and the gorgeous, but similarly-severed Heritage Crossing neighborhood. Doing so would begin to unlock the rest of northwest Baltimore, which contains other untapped historical treasures, such as Lafayette Square and Upton. Planning for all this needs to start right now.